Captain Toad: Treasure Tracker is bright, charming, and beautiful. Much like Super Mario 3D Land, it features small, self-contained levels of floating blocks coated in meadows, beaches and palaces — and baddies, of course! While the building block aesthetic is sometimes worn thin in the Marioverse, the style fully compliments this gameplay, and each level is brimming with detail. Each one acts as a puzzle cube, which you rotate, poke, and prod to find stars, diamonds, and other hidden secrets. 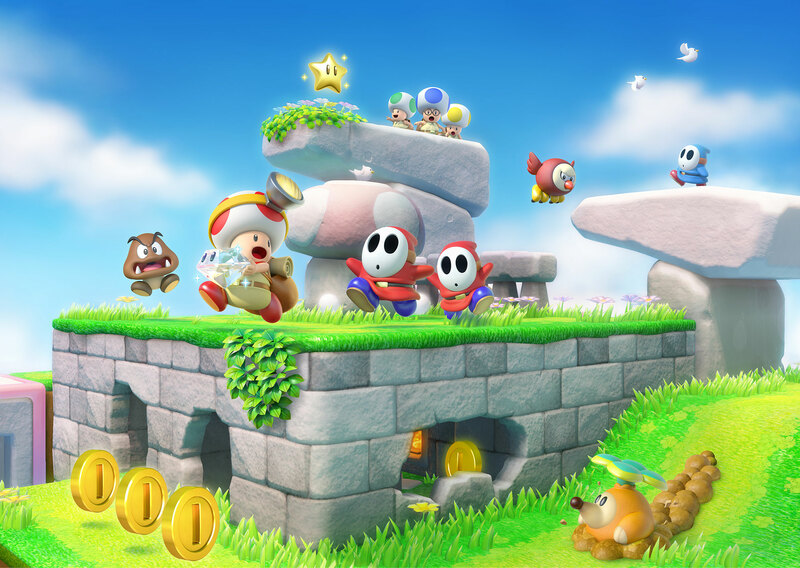 Toad starts his quest collecting Power Stars to rescue Toadette from a nasty bird named Wingo. They reunite to hunt down the foul fowl, and don’t mind grabbing plenty of loot on the way. Also similar to 3D Land, the gameplay is very modular. Finding each level’s star usually takes about a minute, but you might revisit them many times to finish the other goals. This makes it a perfect casual game that you can pick up anytime and play in short sessions. Yet some of its goals can be tricky, making 100% completion a more satisfying long-term challenge. Even though Treasure Tracker is an action-puzzler originally released for Wii U in 2014, as with many gems for the neglected console, Nintendo gave it a second chance last year for the Switch and 3DS. While it didn’t make a splash initially in the gamer world, we should definitely take notice this time around. There isn’t much reason to re-buy the game if you own the Wii U edition, and in terms of graphics, it will render best on the Switch. But Treasure Tracker fits naturally with the 3DS’ controls, and the depth added by the 3D feature helps to analyze the dizzying layers of each puzzle. For what feels like a cute game, it can get frustrating at times. Toad clocks out at two enemy hits, which seems unnecessary. Falling over and a time penalty might have been more appropriate. And if you’ve ever found Toad’s voice irksome, his chirps and squeaks may grate your nerves at times. The hint for finding “hidden Toad” in each level is a shrill squawk that gets louder the closer you get — yikes! Toad’s charm successfully stands on its own, along with Toadette’s, but here he remains as a slightly annoying, one-dimensional cartoon just yet. Treasure Tracker is full of colourful detail and tons of goals, easy to pick up and play but with plenty of challenges across dozens of levels. Though it’s a total detour in the Mario universe, it’s one worth taking.